What progressive activists can learn from a grassroots campaign against transit racism. By Eric Mann originally published in The Nation Magazine on May 27th, 2013. On November 6, 2012, as progressive voters cheered the re-election of Barack Obama, activists in Los Angeles also celebrated a lesser-known victory: the defeat of Measure J, a ballot initiative that would have directed $90 billion in taxpayer funds to local rail and highway projects, and would also have led to crippling fare increases and service cuts for the city’s bus riders. For twenty years, the Los Angeles County Metropolitan Transportation Authority and the Bus Riders Union have been locked in a transit war, with the MTA pouring cash into costly rail projects at the same time that it cut bus service and raised fares. But rail not only generated far fewer riders than a first-class bus system would; it also had massive cost overruns that the MTA solved by raiding bus system funds. The BRU called this “transit racism”: some 500,000 passengers—with a median household income of under $14,000 a year—relied on buses as their means of transportation. Ninety percent of these riders were black, Latino or Asian/Pacific Islander. In 2011, the Federal Transit Administration rejected a civil rights complaint on behalf of the BRU seeking FTA intervention in one of its latest battles with the MTA. The complaint charged the transportation authority with violating Title VI of the 1964 Civil Rights Act, which prohibits agencies receiving federal funds from allocating them in a racially discriminatory manner. The FTA’s refusal to offer a remedy inspired an ambitious national strategy by organizers in Los Angeles. 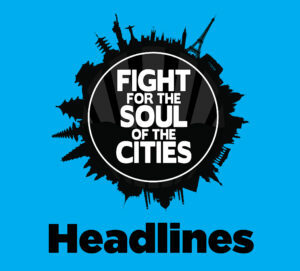 In the spring of 2012, the Labor/Community Strategy Center, a movementbuilding “think tank/act tank” that I direct, rolled out the “Fight for the Soul of the Cities” campaign. In twenty years of organizing, we had seen a corporatized urban plan dominate the public discourse. It was time to fight back against its Disneyfied fantasy and Blade Runner reality with an aggressive social- and environmental-justice master narrative for the city. We began by calling on President Obama to use his authority under Title VI to overturn the FTA’s decision and make civil rights enforcement a top priority for his administration. At the same time, we called on Los Angeles County voters to defeat Measure J, arguing that it perpetuated transit racism and environmental destruction. As the campaign unfolded in the months before the November election, we learned difficult and valuable lessons about achieving regional victories that can shape a national movement. As activists around the country attempt to pressure the president on a range of issues over the next four years, the story of how we organized in Los Angeles can offer an example of a winning strategy for the progressive movement. The Los Angeles Bus Riders Union was founded by the Labor/Community Strategy Center in 1992 with the goal of organizing low-income riders to fight against residential segregation and for jobs and environmental justice. In 1994, represented by the NAACP Legal Defense and Educational Fund, the BRU, along with other community groups, went to federal court to block the MTA’s fare increases and service cuts, charging it with violating Title VI, using funds in a racist manner, and balancing its rail budget on the backs of the black and Latino working class. The courts sided with the BRU, which in turn led to a negotiated consent decree between the parties. Through ten years of negotiations, mass actions and court orders, the MTA lowered bus fares, replaced dilapidated diesel buses with 2,500 new compressed natural-gas buses, significantly reduced overcrowding, and added 1 million hours of bus service. All told, the BRU’s “Billions for Buses” campaign won $2.7 billion in added service and benefits for bus riders—and, for a moment, changed the face of transportation in a megacity. But in 2006, the consent decree expired and federal oversight was lifted. The MTA wasted little time raising the cost of monthly bus passes from $52 to $75 and also eliminated the 1 million hours of service the BRU had fought so hard to win. Encouraged by the election of Barack Obama, in 2010 the BRU and the nonprofit law firm Public Advocates filed a civil rights complaint with the FTA and asked the agency to withhold federal funding if the MTA did not restore the cuts to bus service. In 2011, the FTA found that the transportation authority had violated parts of Title VI and ordered a Corrective Action Plan. But in March 2012, shortly before FTA Administrator Paul Rogoff issued his decision, MTA chief executive Art Leahy publicly stated that Rogoff had assured him that his ruling would not require the MTA to restore any bus service. Concerned, we called Rogoff to ask if he had made such an assurance. He denied it and said that he was still deliberating. But in April 2012, when the final ruling came, it was just as Leahy and the MTA had predicted, word for word. Technically, the investigation is still pending. But it was time to up the ante. The BRU devised a plan. With Obama’s re-election campaign poised to get under way, his platform was sure to come under greater scrutiny. Many civil rights groups felt the administration was weak on civil rights enforcement and encouraged us to make the fight over transportation in LA a test case for federal enforcement of Title VI in terms of employment, the environment, schools, hospitals—in short, every aspect of federal funding. Los Angeles is a high-visibility media center, after all, and Mayor Antonio Villaraigosa, the chair of the MTA board as well as the 2012 Democratic National Convention, is a highprofile Latino with close ties to the president. With Democrats courting Latino voters, there were 5 million such voters in Los Angeles County alone. The city was also a major fundraising haven for the president. A high-profile campaign might convince liberal donors to pressure Obama to take a stand. 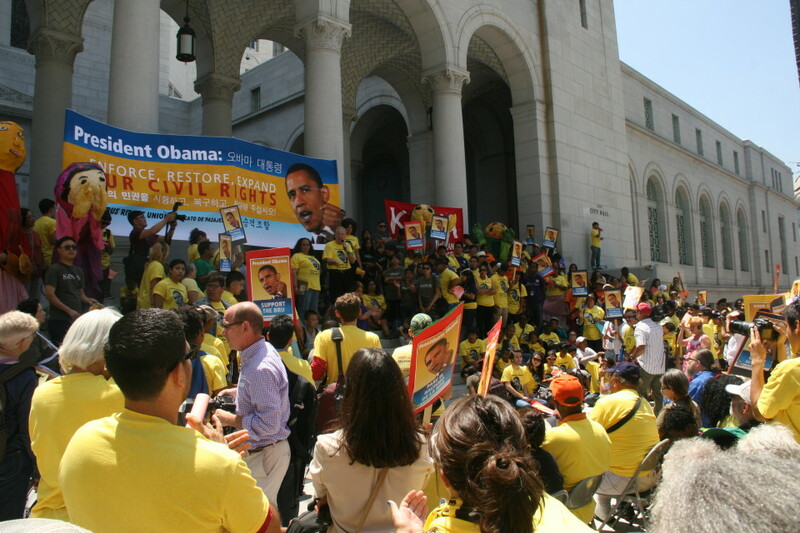 We titled the campaign “President Obama: Enforce, Restore, Expand Our Civil Rights,” kicking it off with a July 26, 2012, rally on the steps of City Hall. Hundreds of demonstrators wore yellow BRU T-shirts featuring pictures of the president, and massive posters showed his image as well. The next day, the Los Angeles Times ran a large photo of the rally with the headline: “Bus Riders Union calls on Obama to restore service hours in L.A.” The BRU had delivered its message. The next day, the BRU got a call from the president’s Domestic Policy Council in response to a letter we had sent to its director, Cecilia Muñoz. The DPC offered us a meeting at the White House, with the caveat that Obama could not intervene with the FTA. Allies involved in the fight for the Dream Act told us that they, too, had been told by Muñoz and the DPC that the president had no authority to help them, before he did just that. So they encouraged us to continue the conversation and keep up the pressure. In August 2012, members of the campaign traveled to Washington and met with the DPC. We began with a short presentation on the MTA’s twenty-year history of civil rights violations against its own passengers and asked the president to restore the 1 million service hours and to withhold federal funds from the MTA until it complied. We were told that while the DPC welcomed our views and supported strong civil rights enforcement, its members could not discuss our case in Los Angeles since it was still under review. Guillermo Mayer from Public Advocates replied, “How can you support enforcement in general but not discuss one of the most egregious cases that requires your intervention?” But we agreed to keep in touch, knowing that the administration would wait to see how the fight over Measure J played out, while we held on to the option of pressuring President Obama beyond the election. No sooner had we returned to LA than we discovered that a “mayoral summit” on transportation and other issues was being held a month before the election. Several high-profile supporters of Measure J were listed as featured speakers. Among the invited guests was none other than DPC director Cecilia Muñoz. We considered dramatically escalating the public pressure on the White House by staging a sit-in at Obama’s campaign headquarters in LA and challenging him at high-visibility fundraising events. But instead we decided to focus all of our forces on defeating Measure J. If we won, not only would we deny the MTA $90 billion in additional revenue over thirty years; we would also shape the terms of the debate. And if Obama was re-elected, we would be in the strongest possible position to re-emphasize the need for federal intervention in Los Angeles. Still, building a grassroots movement to defeat Measure J was a daunting prospect. The “Yes on J” coalition had money and powerful backers, including Mayor Villaraigosa, rail and defense contractors, the Los Angeles County Federation of Labor, chambers of commerce and the Natural Resources Defense Council. It also had a $2 million advertising budget. What’s more, the deceptive ballot language, which was written by the MTA, promised everything from traffic relief to job creation. It glossed over the fact that the measure was a tax extension— an important point, since this also meant it required twothirds approval from the voters. In 2008, the MTA had successfully passed the same sales tax and had won by only 38,000 votes out of more than 2 million cast. Assuming a similar turnout in 2012, we calculated that we would need to win over some 19,000 voters to defeat Measure J. We decided to focus our work on South Los Angeles, home to 850,000 black and Latino residents. The “No on J” coalition began with the Labor/Community Strategy Center and created a diverse alliance: the groups opposing the MTA’s construction of a tunnel for the 710 freeway, which would bring truck traffic into communities; the neighborhood advocacy group Union de Vecinos, opposing MTA-led gentrification; Beverly Hills High School parents, opposing MTA drilling in high-methane areas; and the Crenshaw Subway Coalition, fighting against MTA underinvestment of transit funding in historically black cultural centers. “No on J” argued that the measure would allow the MTA to raid public funds and direct them to corporate rail developers at the expense of 500,000 black and Latino bus riders, who would experience more service cuts and fare increases. The coalition argued that despite more than $10 billion of rail construction over twenty-five years, the bus system still carried 80 percent of all MTA riders and was the only viable future for mass transit in LA. It pointed out that Measure J’s promise of money for the bus system was a deception— the MTA had made similar promises in the past, only to raid the funds and redirect them to rail. For those who asked why rail and bus service couldn’t get along, the “No on J” campaign explained that the MTA was building a rail/highway coalition, with 20 percent of Measure J funds slated for freeway expansion to subsidize the trucking industry and the ports, dramatically increasing greenhouse gas emissions at the very time we need to radically restrict auto use and freeway access. We framed the vote as a referendum on the “Fight for the Soul of the Cities” campaign: a choice of either a city run by the corporatizing, privatizing, polluting and policing classes, or a city with the black and Latino working class at its heart—and with 1,000 more buses, 1,000 more schools and 1,000 fewer police. More than 100 BRU members organized a phone bank operation, calling 30,000 voters in South LA. Opponents of the 710 tunnel did voter outreach in Northeast LA and the San Gabriel Valley. Another 150 BRU members put up 1,000 Fight Transit Racism, No on J lawn signs and distributed 50,000 brochures on buses, in churches and in their communities. They generated 40,000 robocalls in English and 20,000 in Spanish. They put their message online and on mailers that reached hundreds of thousands of people. On November 6, Measure J was defeated by a margin of 16,000 votes. The “No on J” coalition had won, defeating its powerful adversaries in business and government and denying the MTA $90 billion in future funding. The BRU capitalized on its victory by sending a letter to every member of the MTA board, asking them to restore $120 million a year to the bus budget that had been transferred to rail, to restore the previously cut 1 million hours of bus service, to reduce the monthly bus pass to $42, and to expand the bus fleet from 2,500 to 3,500 buses. It also urged the board to emphasize Bus Rapid Transit instead of rail; to use sales tax revenue to provide free, round-the-clock zero-emission bus service; to work with the residents of the San Gabriel Valley and South LA to change its policies; and—of great importance—to end its war on bus riders and its alliance with the highway lobby. Instead, the MTA is now trying to amend California law to reduce the percentage of votes needed to pass “transportation taxes” from two-thirds to a 55 percent majority. It also plans to increase its advertising budget and to ask the Los Angeles County Federation of Labor (LACFL) to devote even more funds and canvassers to a future fight. So the BRU is gearing up for a new battle, working to broaden its support and reaching out to allies in the SEIU, AFSCME, the Amalgamated Transit Union and more. We are asking them to call on Maria Elena Durazo, head of the LACFL, to break her alliance with the construction companies and unions who love so-called “shovel-ready projects” and to side with the vast majority of the working class—from bus drivers and mechanics to hotel and restaurant workers, students and security guards—who are waiting longer and walking greater distances to their low-wage jobs and underfunded schools. The BRU is also asking its allies in the environmental movement to withdraw from the rail/ highway coalition and join the fight for a free, zero-emission bus system and radical restrictions on auto use to reduce greenhouse gas and toxic emissions. The Labor/Community Strategy Center is also refocusing the national civil rights campaign targeting the Obama White House through a strategy that begins with grassroots organizing, a clear set of demands and the moral arguments to back them up. In his second inaugural speech, President Obama invoked Seneca Falls, Selma and Stonewall—real struggles that transformed the national debate and changed federal law. In the future, national civil rights and other progressive campaigns must include inside-the-Beltway groups, but they cannot be the center of gravity. Instead, a national movement will pivot on whether people can organize coordinated transformative social movements in New York and Chicago, Houston and Detroit. It will take a series of high-stakes, high-visibility fights for the soul of the cities to put concerted pressure on the Obama administration to act. In Los Angeles, we are once again calling on the president to demand that the MTA restore the 1 million hours of bus service, dramatically lower fares and otherwise increase service—or lose its federal funding. More broadly, the goal is to pressure the president to address the discriminatory effects of the Supreme Court’s 2001 ruling in Alexander v. Sandoval, which undermined the 1964 Civil Rights Act and held that “private parties” do not have the right to sue to enforce “disparate impact” regulations under Title VI. President Obama can and must reverse this by introducing new federal legislation to restore the right of civil rights groups and other socalled “private parties” to sue government agencies that allocate funds in a racially discriminatory manner. This has to be a top legislative priority for the president’s second term. But in the meantime, President Obama still has enormous statutory authority to enforce civil rights law and combat structural racism. The Supreme Court has held that the executive branch has the power to withhold funds from agencies practicing racial discrimination and that “disparate impact” is sufficient grounds to do so. In every major city in the country and across all counties and states, local governments use funds in ways that have a racially discriminatory impact on schools, hospitals, prisons and more. If he had the political will, Obama could stop all federal funding, not just for the Los Angeles MTA (more than $500 million a year), but for the Chicago school system and New York City jails—and he could use that power to push through dramatic solutions to civil rights abuses. But that would mean challenging allies like Antonio Villaraigosa, Rahm Emanuel and Michael Bloomberg. This may seem like a stretch, but history has shown that challenges to Democratic administrations by independent social movements have achieved momentous victories. Even as Martin Luther King’s protests were blocked by Democratic politicians from Selma to Chicago, elected officials, ministers, and labor and community leaders with close ties to the Democratic Party were breaking the silence on segregation and the Vietnam War. The Mississippi Freedom Democratic Party—led by Fannie Lou Hamer, Victoria Gray Adams and Annie Devine—and courageous SNCC volunteers lined up Democratic delegates who challenged the lily-white Mississippi delegation at the 1964 Democratic convention and generated a debate that Lyndon Johnson and Hubert Humphrey could repress but not control. Courageous Democrats like Abraham Ribicoff condemned Democratic Mayor Richard J. Daley’s “Gestapo” police tactics against protesters at the 1968 convention. Democratic Senators Wayne Morse, Ernest Gruening, George McGovern, Frank Church, Bobby Kennedy and Eugene McCarthy spoke out against Lyndon Johnson and the Democrats’ war in Vietnam and sided with the anti-war movement that was shaping the terms of the debate. It is with this history in mind that we will once again bring the demands of Los Angeles bus riders to the White House as part of a national civil rights initiative. There would be no greater use of the president’s executive authority than to take up Title VI, the hammer of the 1964 Civil Rights Act, and strike a powerful blow against racism in government policy in every city in the land. Click here to send an e-mail to President Obama urging him to Enforce the 1964 Civil Rights Act! Those low-income workers being deprived of accommodating and timely bus services and unecessarily higher rates need justice and their rights given attendion under Title VI. Their service cuts, under cutting funds and moving them to higher cost rail needs attention and corrective action. I hope that President Obama gives his notice and power for this cause.